Dynamic geometry constructions are commonly embedded into hypertext documents to create interactive exercises. In practice, this approach often constrains the possibilities of creating complex learning environments due to technical limitations. A Java-based framework for the development of interactive learning environments based on exploration laboratories containing dynamic geometry applets is presented. Dynamic geometry software (DGS) applets of different types can be integrated into the same laboratory and interact with each other. Within our framework, interactive exercises based on DGS constructions can be enriched with automated and semi-automated assessment algorithms. Students’ learning processes can be recorded using capture-and-replay software. Two sample learning environments based on the framework are presented. Presented at the I2GEO 2010 conference. MoveIt!-M, ColProof-M, and Squiggle-M are available at http://www.sail-m.de/. The framework Yacht-M and all software based on it will be published under an open source license after a careful revision. To receive a preliminary version, contact the author. 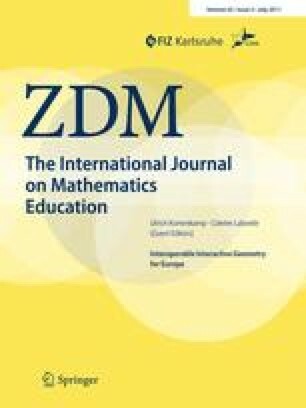 This work was part of the project SAiL-M—Semi automated analyses of individual learning processes in mathematics funded by the German Federal Ministry of Education and Research. The feedback module Feedback-M was developed during the same project at RWTH Aachen. The learning software Squiggle-M is also part of the project and was developed in cooperation with Maren Hiob-Viertler, PH Weingarten and Andrea Hoffkamp, TU Berlin. ActiveMath (2007). ActiveMath. http://www.activemath.org/. Accessed 7 Jan 2011. Baptist, P. (2004). GEONExT. http://geonext.uni-bayreuth.de. Accessed 15 Sept 2010. Egido, S., Hendriks, M., Kortenkamp, U., Kreis, Y., & Marquès, D. (2010). I2G intergeo common file format final version. The Intergeo Consortium. http://i2geo.net/files/D3.10-Common-File-Format.pdf. Accessed 15 Sept 2010. Elschenbroich, H.-J. (2004). Dynamische Geometrie. http://www.dynamische-geometrie.de. Accessed 20 June 2010. Geogebra (2010). GeoGebra. http://www.geogebra.org/. Accessed 15 Sept 2010. Hocquenghem, M.-L., Kotecki, F., & Séres, P. (2010). Geoplan/Geospace. http://www.aid-creem.org. Accessed 15 Sept 2010. Intergeo (2010). I2geo Intergeo. http://www.i2geo.net. Accessed 20 June 2010. Kortenkamp, U. (2009). I2G API specification. The Intergeo Consortium. http://i2geo.net/files/D3.5-API-specification.pdf. Accessed 15 Sept 2010. Mumie (2009). Mumie—online math education. http://www.mumie.net/. Accessed 7 Jan 2011. Richter-Gebert, J. (2009). Mathe vital. http://www.mathe-vital.de. Accessed 20 June 2010. Sesamath (2010). Mathenpoche. L’association Sésamath. http://mathenpoche.sesameth.net. Accessed 15 Sept 2010. Spannagel, C., Gläser-Zikuda, M., & Schroeder, U. (2005). Application of qualitative content analysis in user-program interaction research. Forum: Qualitative Social Research, 6. http://www.qualitative-research.net/index.php/fqs/article/view/469. Accessed 20 June 2010. Vanroyen, J.-P., & Ostenne, E. (2004). TracenPoche. http://tracenpoche.sesamath.net. Accessed 15 Sept 2010. Xiao, G. (1999). WIMS—a server for interactive mathematics on the Internet. http://wims.unice.fr/. Accessed 7 Jan 2011 (online).